HyreCar has created a digital marketplace for Auto Dealers to provide vehicles to drivers in the rideshare and Mobility as a Service (MaaS) industry. Mobility as a Service (MaaS) is a consumer-centric model of people transportation characterized by realtime, on-demand nature, easy route planning, simplified payments, and personal relationship between users and transport providers. 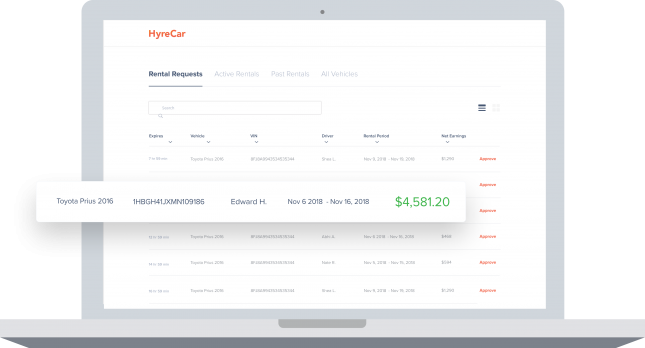 HyreCar's turn key solution allows Auto Dealers to take advantage of this shift in the automotive industry by connecting them directly with rideshare drivers to earn incremental reoccuring revenue and sell more vehicles. Dealers have the infrastructure in the areas needed to serve rideshare drivers. 50,000+ rideshare drivers sign up every month. 40% of those DO NOT have a qualifying vehicle. Rideshare drivers want to utilize and buy vehicles from dealerships that can service them best. Odometers used to be the measure of a vehicle's value. Now it's revenue. HyreCar provides a catered Path to Purchase program for rideshare drivers in convert with the HyreCar partner dealer. Rideshare drivers are looking to buy your vehicles. Make depreciation work for you and get miles on your program vehicles to qualify for resale. Click below to call us and find out how. turn-key solution for progressive dealers to not only survive the MaaS revolution, but to thrive from MaaS!" Sell more vehicles with HyreCar! You'll get access to the "Path to Ownership" program, which helps you sell more vehicles to rideshare drivers. Earn more revenue with what you already have. Click below to sign up and see how! Are under-utilized loaners costing you money? We can fix that. We'll connect you with drivers interested in cars from your dealership. Rent your car to drivers daily, weekly, or monthly. Your assets will always be covered by insurance and our customer support. Pull from your rental prospects to sell more vehicles. Fill in this form and we will reach out within 24 hours. © 2019 HyreCar. All rights reserved.